Still from Air’s Nicolas Godin‘s new music/surf video. When I made my ‘bucket list’ at the start of my 40th year, I never would have guessed that my two top goals, learning to surf and being a zombie, would cross over in such a bizarre and appropriate way. Check out this weird yet strangely relaxing music video from Air’s Nicolas Godin. 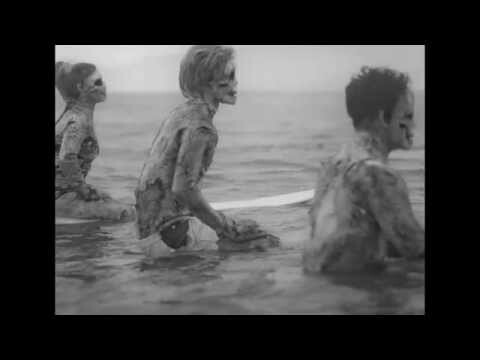 The video features zombie surfers, played by South African pros Michael February, Simone Robb and Matthew Moir. Set to Nicolas Godin‘s new solo recording “Widerstehe doch der Sünde” or Stay Away from Sin, Godin is one of the duo that makes up the French retro-futurist Air. The zombie surf video was directed by The Sacred Egg and produced by Riff Raff Films. Bucket list #1, become a zombie on the Walking Dead (with the surprise bonus of meeting the amazing Andrew Lincoln). Photo by Iliana Sanchez Taylor. These 30 million year old cave formations are a majestic backdrop to the bioluminescence of the glowworms. Photo by Joseph Michael. Arachnocampa luminosa is a species of glowworm endemic to New Zealand and a fungus gnat that hangs down from the ceiling of caves with a silken thread. Both larvae and pupae are luminescent and although males stop glowing after a few days; female’s glow increases, likely to attract a mate and prey. Its Māori name is titiwai, meaning “projected over water”. The Waitomo Caves in the North Island and the Te Ana-au Caves in the South Island are the best known habitats, both caves having become popular and highly frequented tourist attractions. Photo by Joseph Michael. Every March, the Ucluelet Aquarium on Vancouver Island, Canada sets out to catch specimens for their hands-on exhibits, and every December, the aquarium closes and the critters are released. Above: Investigators arrive on the scene at Reunion Island. Photo: AFP/Getty Images. The answer may seem obvious enough to some, but experts are waiting for certainty. Other Boeing 777s have crashed into the Indian Ocean in recent years, including Yemenia Airways Airbus A310, which went down off Reunion in 2009. Still yet, the partial debris may be the flaperon (a gimbaled foil on the back edge of an airplane wing) of an even older crash. “Shark fins in the sky.” Waves of humidity roll over San Cristobal Island in the Galapagos. Photo: Chris Miller. Kelvin-Helmholtz instability clouds break just like waves, crest over trough, only in the sky. They happen when there is a velocity shear, a difference in windspeed between layers, where the top layer moves faster than the bottom.